As Smartphone Growth Skyrockets, Which Brand Will Dominate? In the race for worldwide smartphone dominance, Apple has finally passed Research In Motion. During this year's third quarter, 15.4 million iPhones were shipped globally compared to only 12.4 million Blackberries, the researchers at Strategy Analytics reported yesterday. 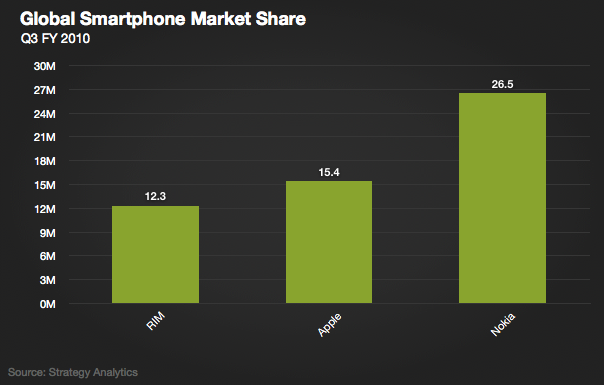 With the shipments, Apple grabbed a 15.4 percent share of the market during the period, while RIM finished well behind with a 12.3 percent share. Top dog in the kennel, though, remains Nokia with 26.5 percent of the worldwide market. "It wasn't really a terrible loss for RIM, though, as the entire smartphone market grew 78 percent overall," explains Darrell Etherington at Gigaom. "And though Apple did surpass RIM in sales volume (and seems poised to ship even more in the future, since supply constraints provided a choke point in 2010), it still has a long way to go before it approaches Nokia, the reigning king of the smartphone hill." The gloomy news for RIM won't be abating soon, either, according to The Economic Times. The company isn't making any inroads into the consumer market. "The lack of a strong ecosystem supporting RIM's platform in the consumer market is one of our key concerns," Sameet Kanade, a financial analyst with Northern Securities, observes in a note to clients on Tuesday. "Although RIM is attempting to make gains in this area as highlighted by the recent acquisition of California-based Cellmania," he says, "we believe the gap between RIM and the two leading competitors in the consumer market is increasing every quarter." To make matters worse, RIM's bread-and-butter buyers--corporations--are starting to slide into the Apple fold. At its earnings conference on Monday, Apple told analysts that since the iPhone 4 began shipping in June, 80 percent of the Fortune 500 companies have adopted the platform. "We believe the potential adoption of the iPhone by key RIM enterprise users may have a domino effect, creating further market disruption for RIM," Kanade asserts.